In the frontal impact, the screen pillar was heavily deformed at the top of the windscreen and the roof was bent in front of the B-pillar. The rear passenger floor panel and tunnel were completely separated, extending into the driver's footwell and the transmission tunnel was deformed between the front seats. The car was penalised for the instability of its passenger compartment in the test. Dummy readings indicated marginal protection of the passenger's chest and structures in the dashboard presented risk of injury to the knees and femurs of driver and passenger. Protection of the driver's feet and ankles was rated as marginal, owing to deformation and rupture of the footwell area. In the side barrier impact, protection of head, abdomen and pelvis was good and that of the chest was adequate. In the more severe side pole test, dummy readings of rib deformation indicated weak protection of the chest. The seat and head restraint provided poor protection against whiplash injuries in the event of a rear-end collision. In the frontal test, forward movement of the 3 year dummy, sat in a forward-facing restraint, was not excessive. In the side impact, both the 3 year and 18 month dummies were properly contained by the protective shells of their restraints, minimising the risk of head contact with parts of the car interior. The passenger airbag can be disabled to allow a rearward-facing child restraint to be used in that seating position. However, the airbag switch was poorly labelled and information provided to the driver regarding the status of the airbag was not clear, and the system was not rewarded. The dangers of using a rearward-facing restraint in the passenger seat without first disabling the airbag were clearly labelled in the car. The bumper provided good protection for pedestrians' legs in all areas tested and scored maximum points. However, the front edge of the bonnet was poor, and scored nothing. In most areas likely to be struck by the head of a child, the bonnet provided poor or marginal protection. In those areas where an adult's head might strike, protection was predominantly poor. The Lodgy does not have electronic stability control as standard equipment so it was not assessed by Euro NCAP. A seatbelt reminder is standard on all variants for the driver and passenger seats. A speed limitation device is available as an option but was not assessed by Euro NCAP because it is not standard equipment. 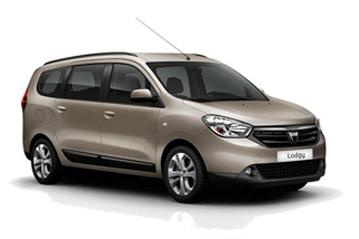 Getest model Dacia Lodgy 1.5 dCi "Laureate"